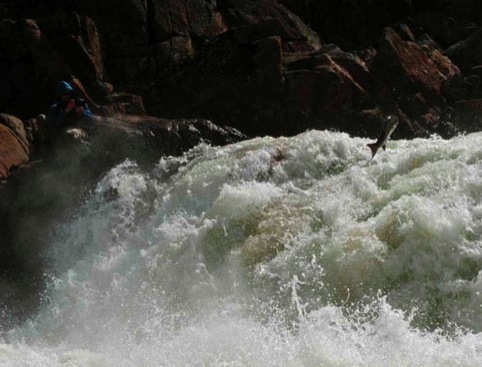 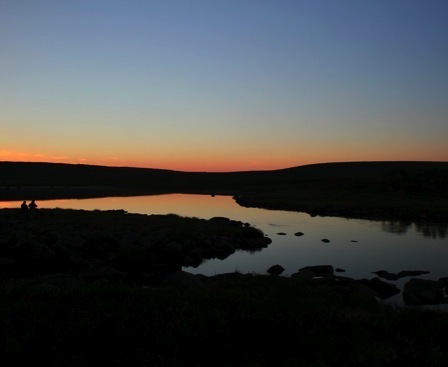 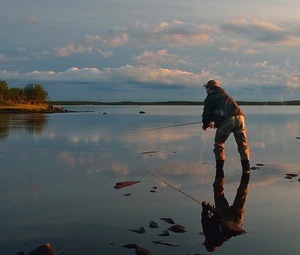 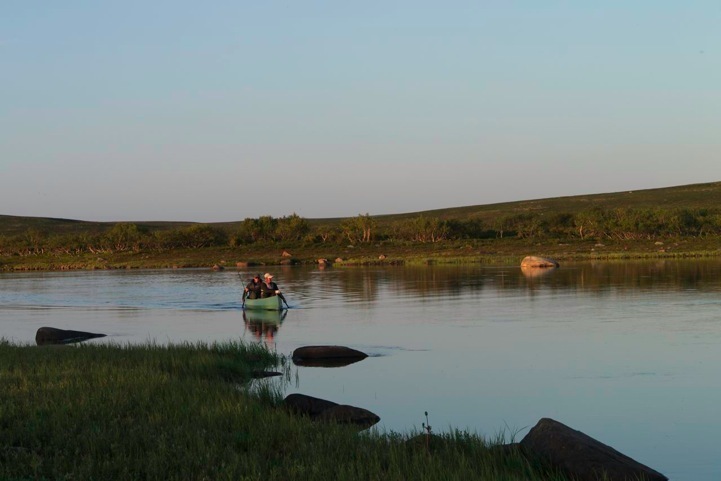 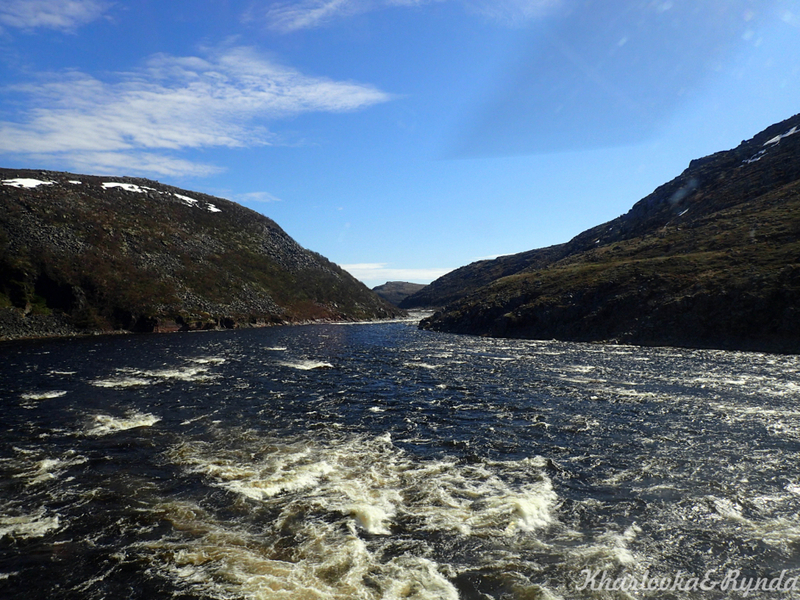 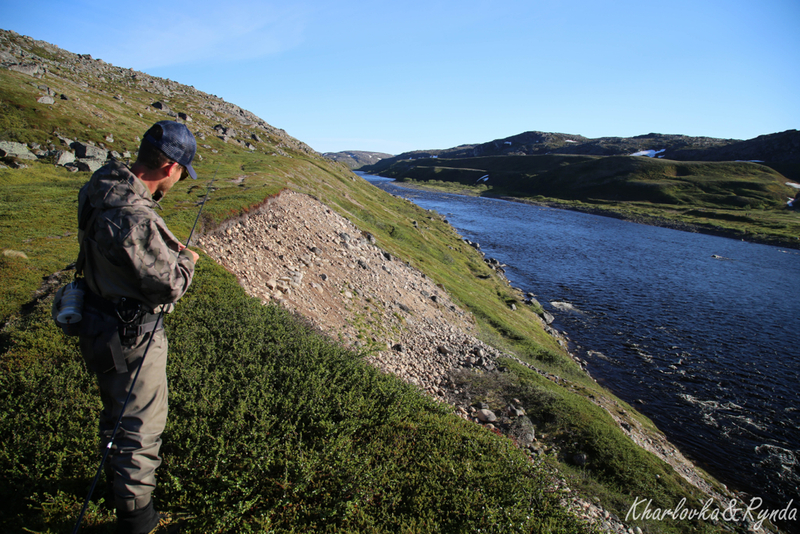 Summer like conditions finally arrived to the far northern tundra along with plenty of sun and warming rivers last week that went from 7.6C up to 13C – while water levels dropped away nicely at about 6cm/day to finish the week at 76cm on the home pool scale. 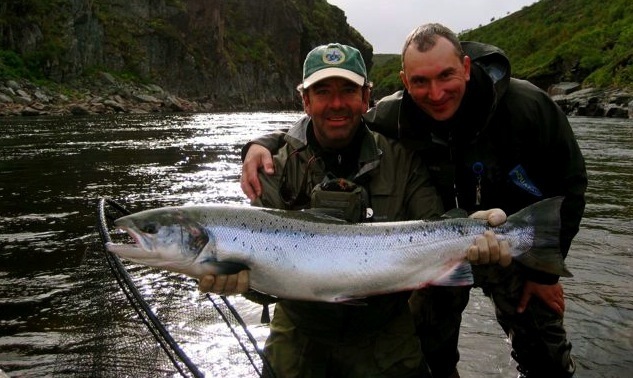 The combination of the rivers warming and the levels dropping led to some fantastic fishing results for the lucky group of 12 international guests. 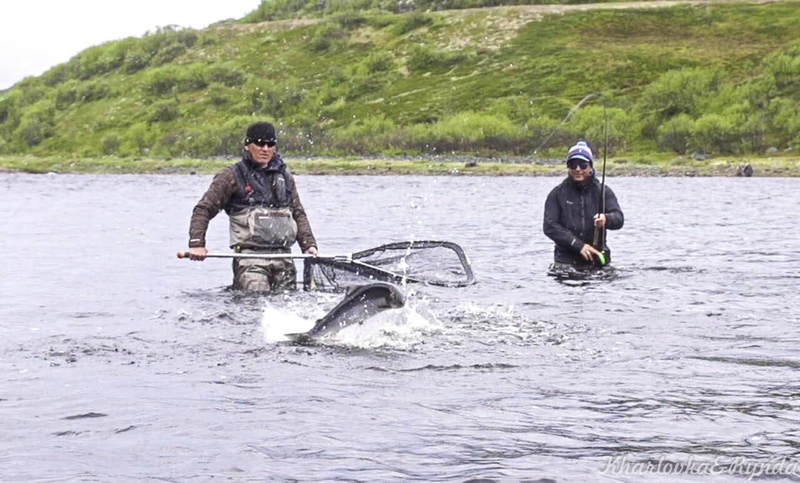 Following introductions and group bonding the boys were obviously here on a mission going onto release 59 salmon in the first 1.5 days before Sunday dinner. 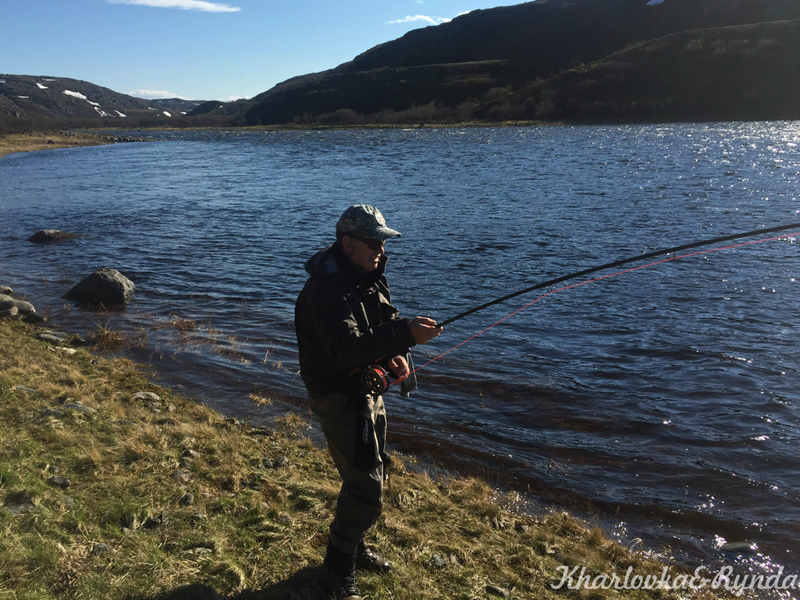 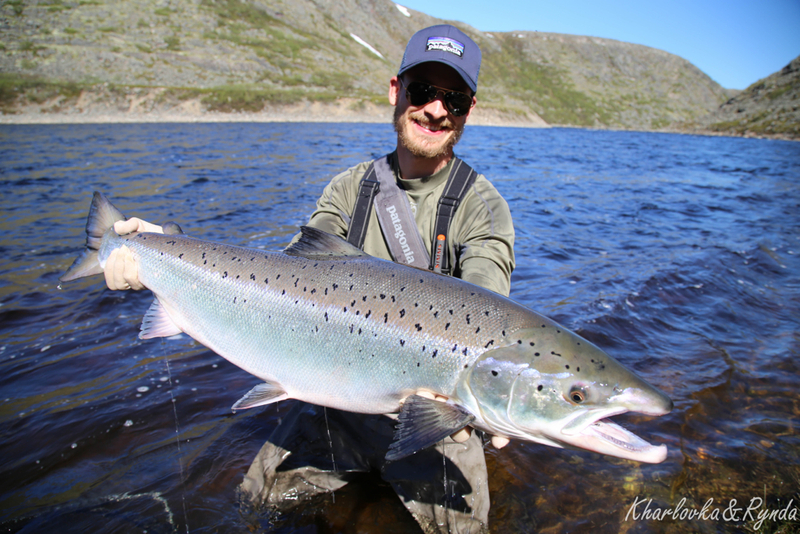 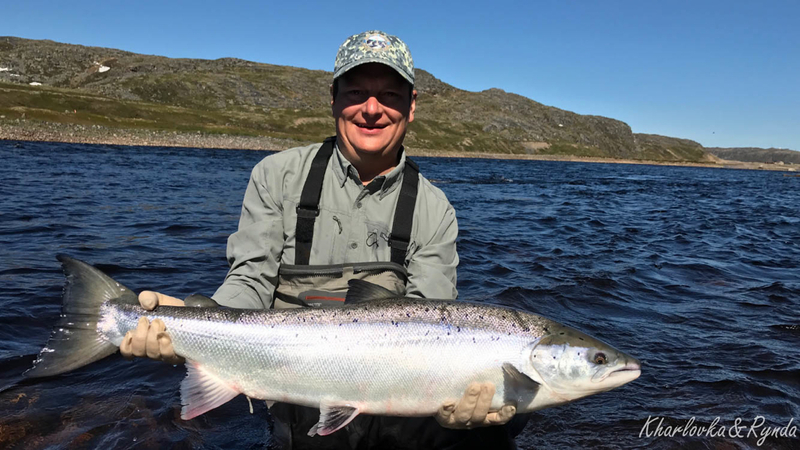 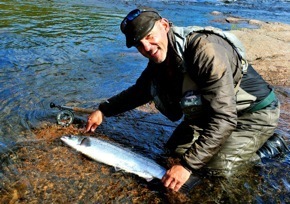 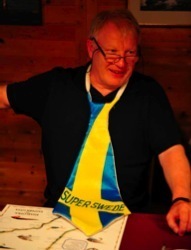 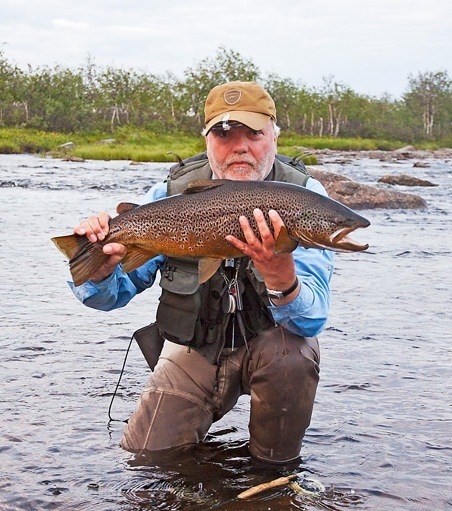 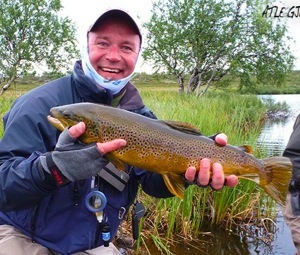 Although the whole team started well – special opening honours went to our new friend Helmut S – who landed a brace of 18 pounders – which were both P.B.’s and were also his first two salmon ever! 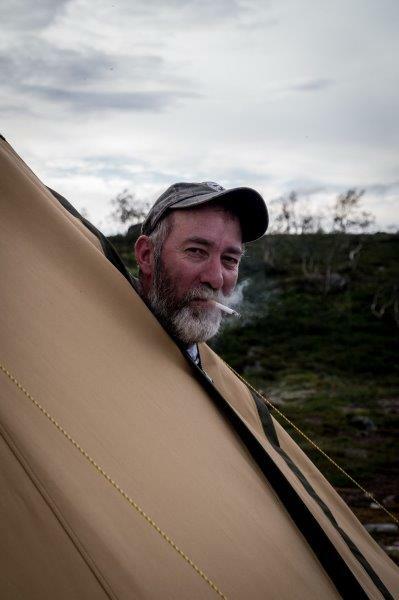 The next day Helmut snapped a photo of his third new P.B. 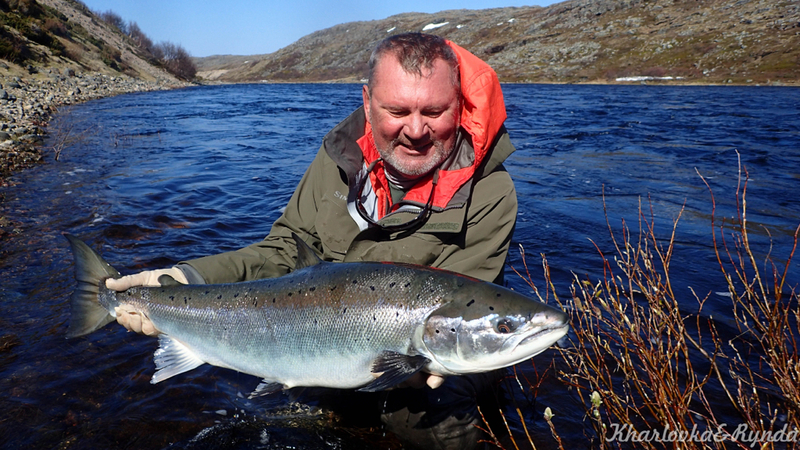 to start the week – 19 pounder from the lower Litza. 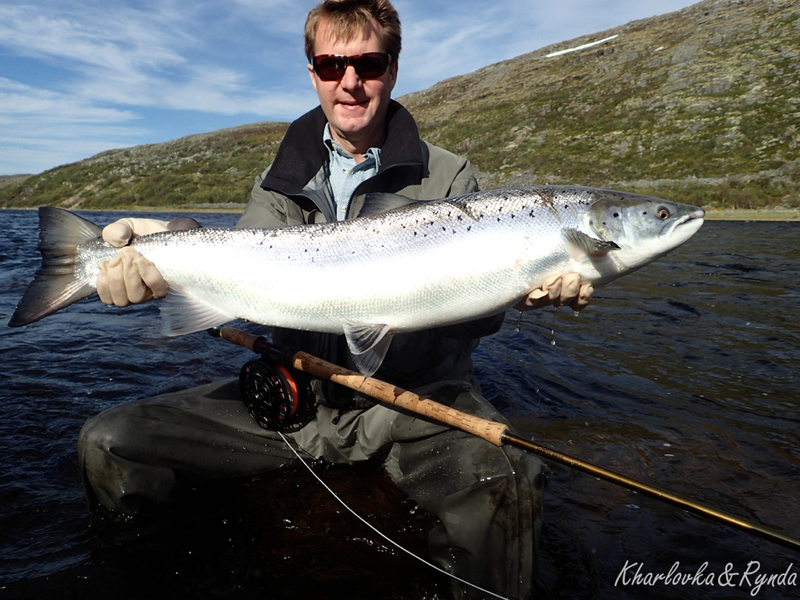 Early week the weather conditions and the fishing were bright and hot – with the group landing about about 35 salmon/day. 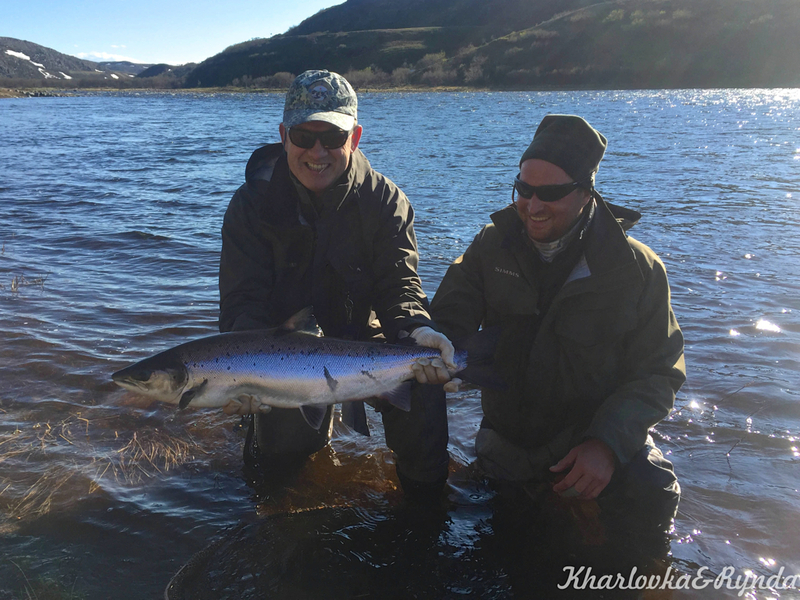 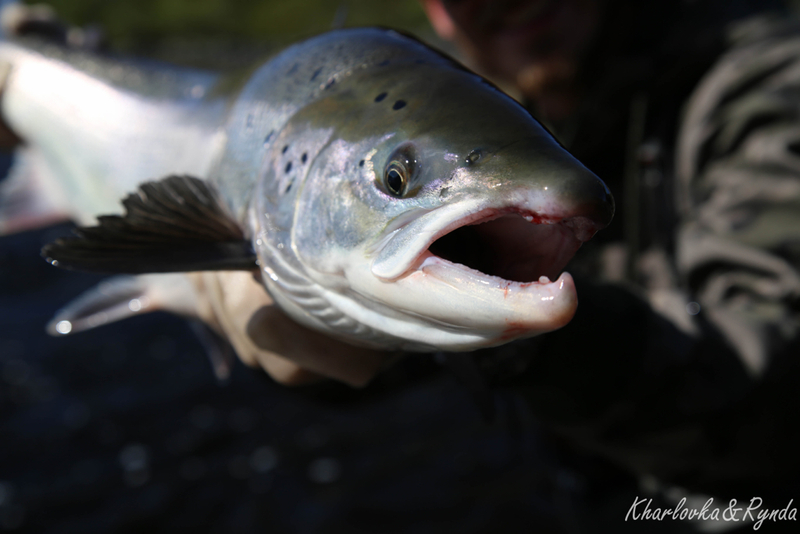 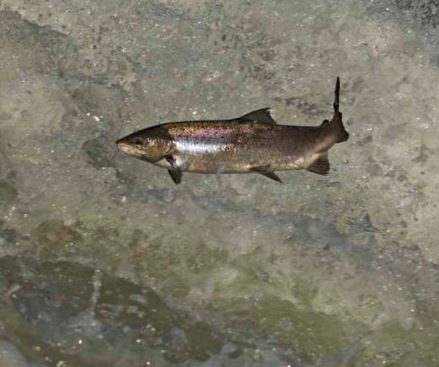 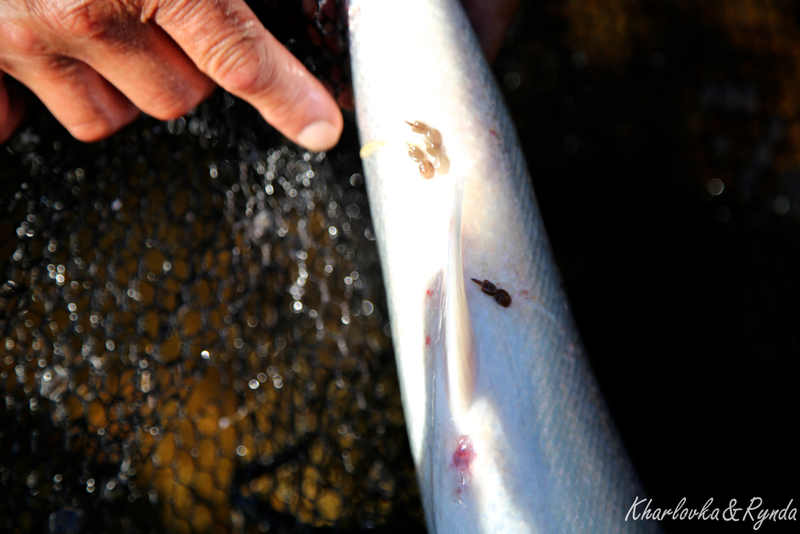 Although light sink tips were still affective with the high water, many of the salmon were starting to come off the surface on floating lines and hitched flies. 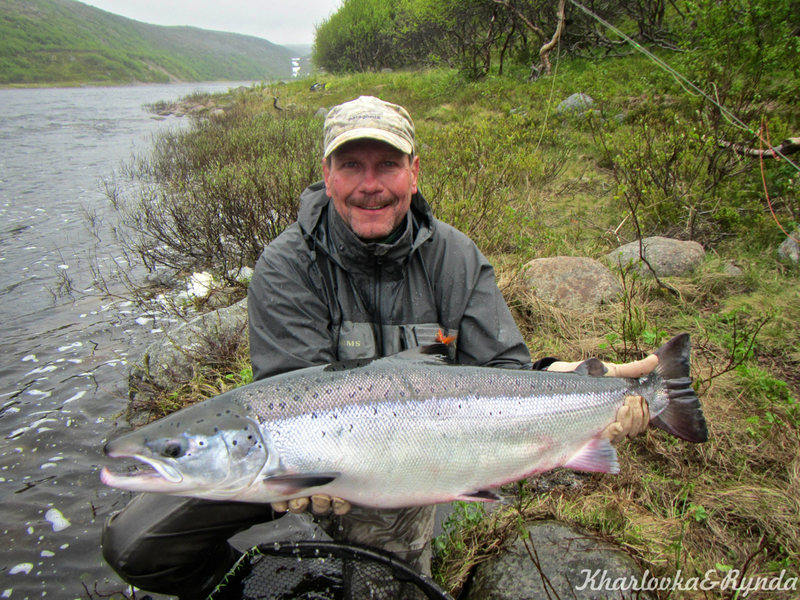 The final days of the week saw conditions improve when the clouds and cooling temps returned. 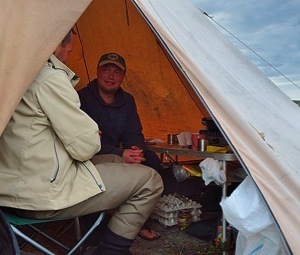 Always nice to see our great friends Grigoriy and Andrey back every season who both like to fish hard with 24 salmon on the week and always find a way to enjoy everyday on and off the water. 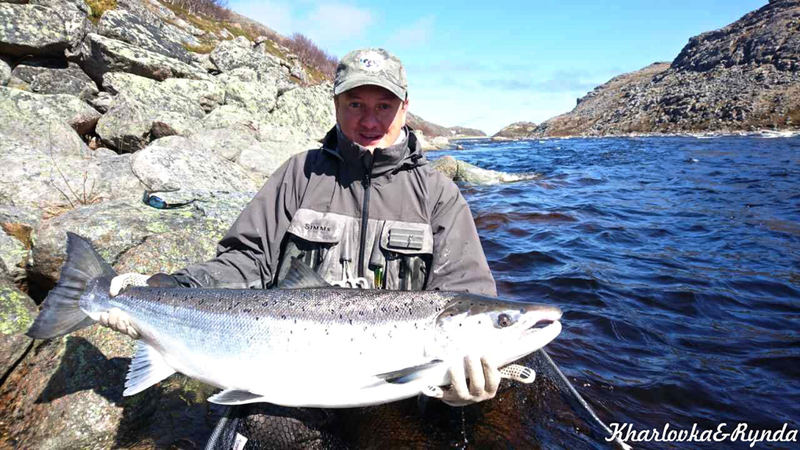 Also to Sergey who added another 14 salmon to the fishing book including this 20 pounder one sunny morning off the lower Kharlovka. 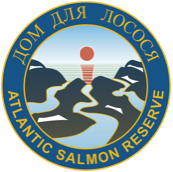 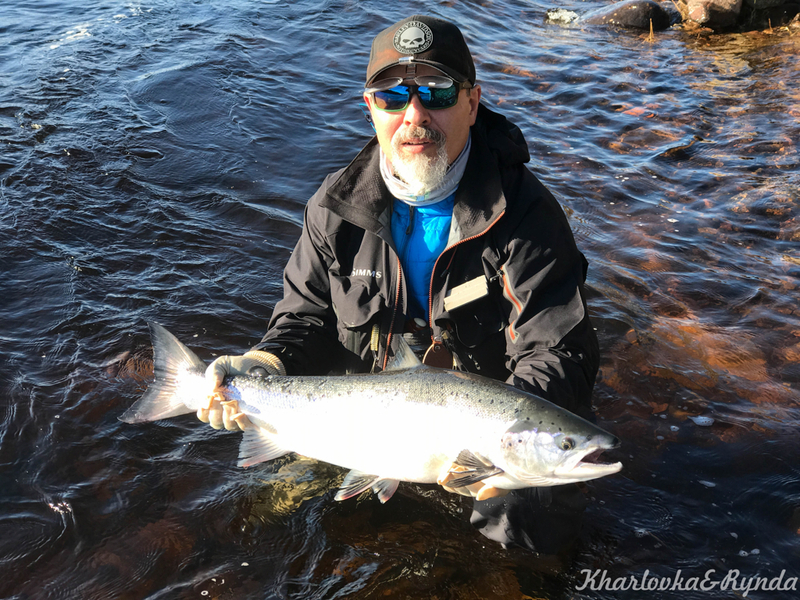 Vladimir Jr. was also on his second week of the season releasing 20 salmon last week and a further 27 salmon this week that included 6 great fish over 20 pounds. 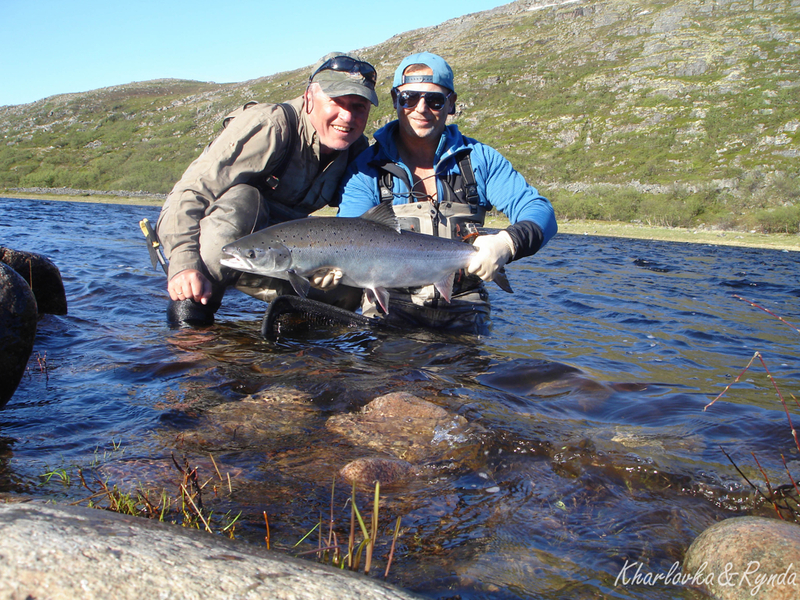 However, after catching this spectacular 28 pounder last week, Vladimir Jr. was content to wait for his next 30+er before snapping the next shot. 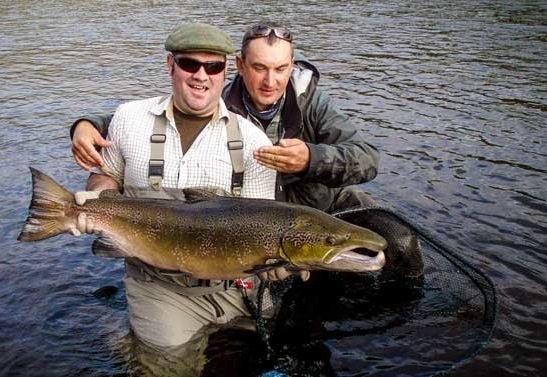 Like father – like son..
And it was luck of the Irish this year for good ol’ Richard and his fishing mate James with no mozies and loads of salmon including one monster each that managed to break through the net. 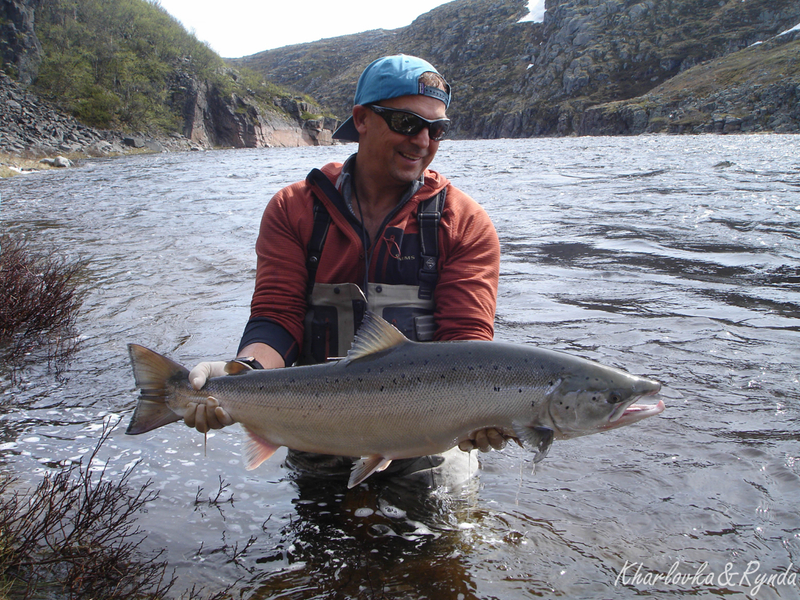 Also a pleasure to see Matt who prefers to store his kit on camp all winter for his return every season – who together with his good friend Big Alex had an amazing week fishing the extreme high water conditions landing 20 with 5 over 20 pounds including a 30+er that should have stayed in the net..
After taking several long disappointing years off to recuperate from a knee injury, our good friend Juerg was finally back in top form – chasing the big ones down the bank. 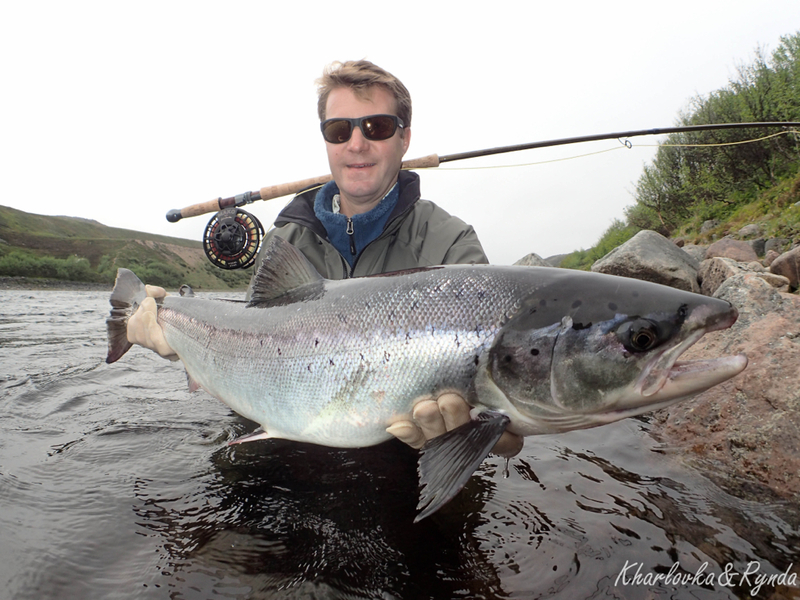 Making up for lost time, Juerg made the most of every day releasing 14 good salmon including this 22 pounder from the Barrel pool on the lower Kharlovka. 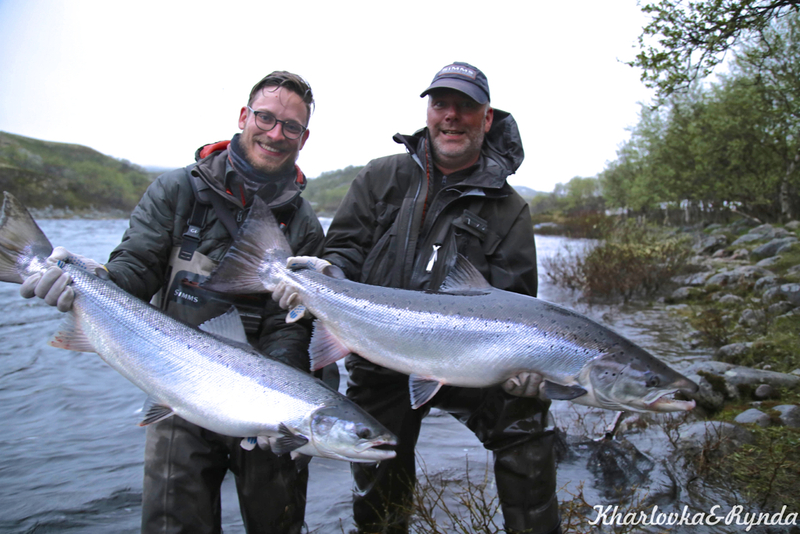 And while this was a fantastic week for all with a total of 247 salmon for the week – team Austria with Helmut Z – Christopher and Helmut S deserve special mention for releasing 96 of the fish including this wonderful double salmon photo that will serve as a memory of the 7 salmon they had that unforgettable night after dinner in the Home pool. 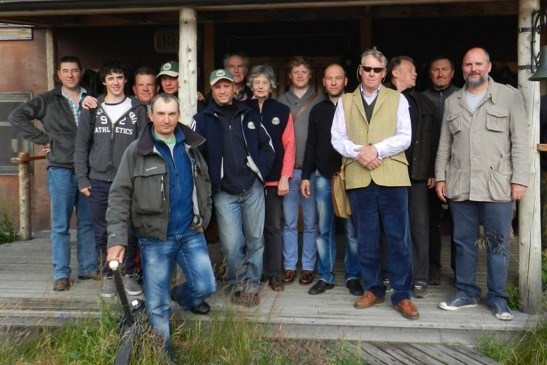 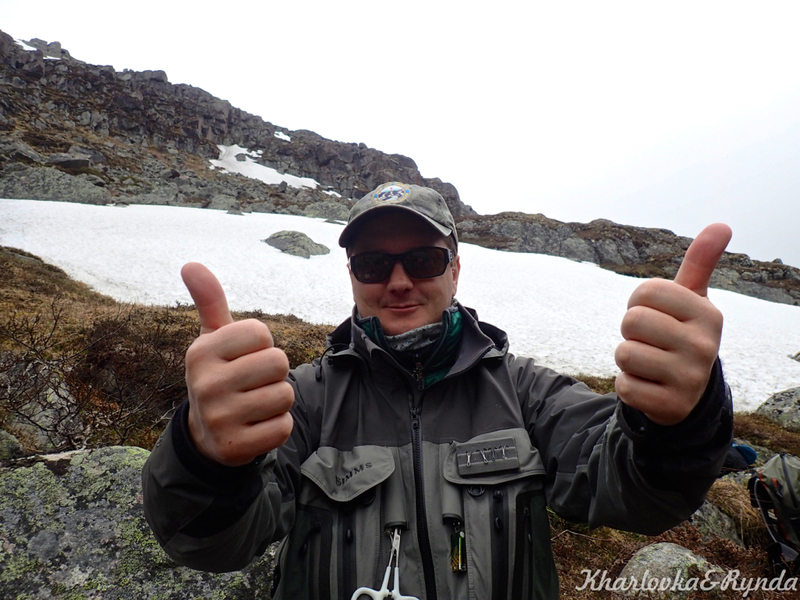 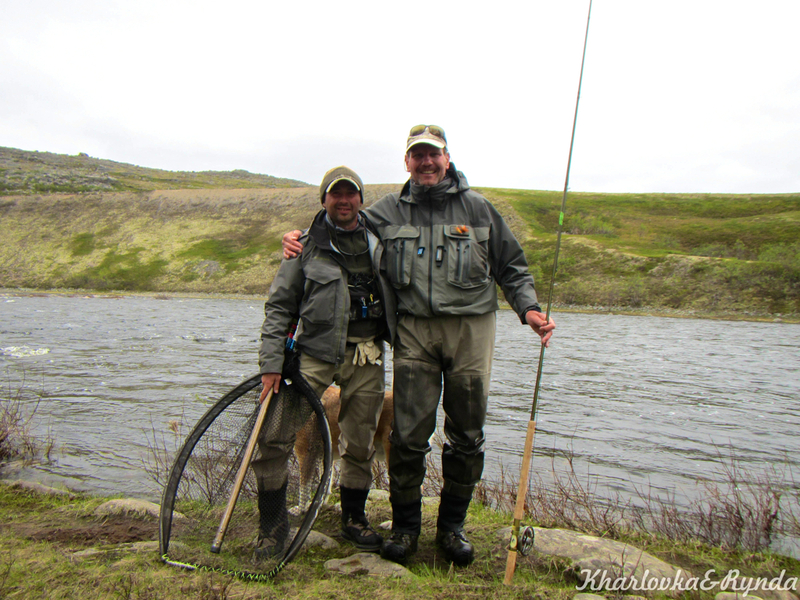 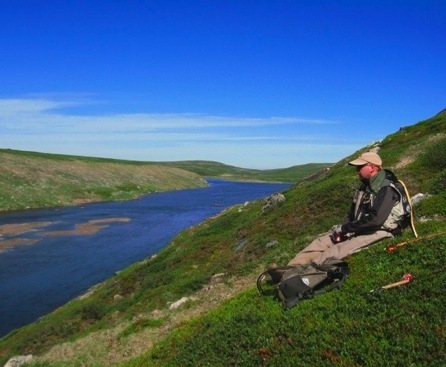 To good fishing and good friends – Nastrovia!